How do military aircraft helmets track where a pilot is looking? These days, fighter pilots' helmets are nearly as complex as their airplanes. And with good reason: If the helmets can't tell where the pilot is looking, many of the airplane's systems, including weapon targeting, are useless. The folks at San Jose, California, who have designed advanced U.S. military helmets for the F-15, F-16, and F/A-18, make their living at the nexus between man and machine. VSI's flagship program is the Joint Helmet Mounted Cueing System. It uses a magnetic field in the cockpit to sense the orientation of the helmet, then feeds information on the current line-of-sight to the aircraft's flight computer. VSI's helmet has an accuracy of about four milliradians, an angular measure commonly used in the world of shooting and targeting. One milliradian equates to one one-thousandth the distance to the target. So if the target is 1,000 feet away, you'd be accurate to within a foot. Determining where a pilot is looking by tracking eye movement is a much taller order. "You would not believe some of the human factor issues you have to overcome to have a successful eye tracker," says Louis Taddeo, VSI marketing director. "Although we have research projects into eye tracking, it is a very difficult task both from a technical [standpoint] and the physiology." So for now, VSI uses helmet position to achieve that four-milliradian accuracy. Pilots need only turn their heads to aim their weapons, even during high-G maneuvers, freeing their hands for other tasks. The head-up displays (HUDs) currently used in fighter aircraft are sophisticated, but they have a single, fixed point of view. Future helmets will include virtual displays projected across the visor, where the pilot can see information and targeting prompts. The F-35 Lightning II helmets due to enter service in 2012 will offer what Taddeo calls "extreme off-axis targeting." Instead of having to turn the airplane toward the target to frame it in a fixed-view HUD, the pilot will be able to see targets that are off-axis, or not in the direction of flight. Like its predecessors, the Lighting II helmet will use magnetic head tracking, but VSI says the accuracy will be greater, courtesy of software upgrades that combine head position with eye location and data from the HUD. 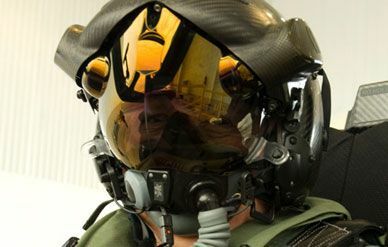 Lockheed Martin test pilot Jon Beesley took the new helmet for a test drive last April in the first pre-production F-35. It was the first time a pilot in a tactical fighter had flown without a HUD in at least three decades. Expect more flights if the reviews are good. Why do we have to turn off iPods during takeoff? Why do airline seats have to be in an upright position during takeoff?